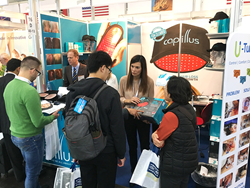 Capillus is not only delighted to be a first-time exhibitor at Medica, but it is equally excited to showcase its complete line of laser therapy caps including the recently released CapillusRX™ which contains more lasers than any low-level laser therapy device in the market for home treatment of hair loss. Its 312 diodes provide maximum simultaneous coverage of the scalp by any device for treatment of hereditary hair loss. It is available only through the company’s global physician network. Medica is the world’s largest medical trade fair for medical technology, electro-medical equipment, laboratory equipment, diagnostics and pharmaceuticals. The fair is held annually and it is open to trade visitors only. In addition to its CapillusRX™ available only through its physician network, Capillus currently offers three FDA-Cleared laser caps for direct sale via http://www.capillus.com: 1) Capillus82™, an economical and convenient device with 82 laser diodes, 2) Capillus202™, a powerful yet affordable device containing 202 laser diodes, as well as 3) CapillusPRO™, a professional-grade device with 272 laser diodes. Capillus laser therapy caps use Low Level Laser Therapy technology (LLLT), which is a non-invasive and chemical-free medical treatment for hair loss. The Capillus laser therapy caps use a six-minute protocol which greatly reduces the time it takes to receive treatment. Capillus laser therapy caps are manufactured in the USA from foreign-source raw materials. The Capillus facility is ISO 13485 compliant, and it is located in Miami, Florida. Capillus, LLC offers prescription and over-the-counter hair regrowth products and medical devices for both men and women suffering from hair loss. The Capillus premiere product lines include low-level laser therapy (LLLT) devices that are FDA-cleared and manufactured in the US under the highest-quality certification standard for the medical device industry (ISO13485). Capillus also offers additional non-prescription clinical hair products for hair and scalp health. Capillus products are available directly to the public for at-home use and also to their network of physicians for office use.